The flurry of M&A deals announced in 2011, including AT&T’s agreement to acquire T-Mobile USA, ConAgra’s proposed bid for Ralcorp, and eBay’s acquisition of GSI Commerce, indicate that M&A has returned, and is perhaps headed back to the levels seen before the financial crisis. Most firms of a certain size will turn to it in their search for growth, forcing almost all managers to face up to the challenge of integration at some point their career. For many managers it is often their first, and only time and M&A is high on the list of things that many managers hate. According to many studies, 50 to 75% M&A transactions turn out to be a failure. One of the main reasons for failure is late or wrong integration or bad integration management. There is a significant demand for more information on best practice in Post Merger Integration. 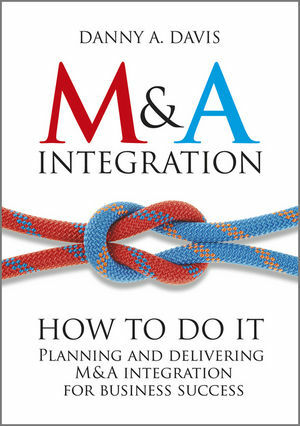 Danny Davis demonstrates how to handle the post-merger integration process and show how to restructure, consolidate, reduce costs, create efficiencies and perform M&A, from smaller transactions to mega-mergers. The focus is on integration planning and delivery. The book combines a general/strategic view with detailed information of how to actually conduct a Post Merger Integration via very practical tools and check lists that will prove essential in delivering change before, during and after transactions as well as to ensure their success.